It doesn't take too much research into early English Bible versions to realize that there was no love lost between Protestants and Roman Catholics during the 1500's. For centuries the Catholic Church had based its beliefs on the Latin Vulgate version of the Bible and the "tradition of the Fathers." Since very few English-speaking persons knew how to read Latin, the Bible had to be translated and explained to them by the Catholic clergy. Protestants, on the other hand, believed in the sole authority of the Scriptures (somtimes called "sola scriptura"), and felt that the Word of God should be translated into the language used by everyday people and available to everyone. They felt that many corruptions had come into the Catholic Church because so few people were able to read and understand the Bible for themselves. In high religious circles, each side considered the other as enemies. The word "Protestant" had yet to come into favor; Catholics simply called non-Catholics "heretics" — not a way to make friends and break down barriers. So Catholics stuck to their Latin Bible, while Protestants kept on producing new English-language versions. Rather than cool the fires between Catholics and Protestants, this new Catholic version gave Protestants even more material with which to confront the Roman Catholic Church. The Bible described on this page was part of the continuing battle between English Protestants and the Church of Rome. 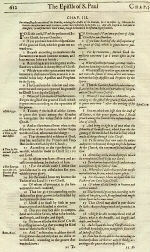 This dual-version New Testament Bible was printed in London in 1617 by Thomas Adams. In the left column (in standard Roman typeface) are the text and marginal notes from the Rheims New Testament of 1582 — the Bible authorized by the Catholic Church. In the right column (in italics) is the 1568 Bishops' Bible — used by the Anglican Church and other Protestant sects. The differences in interpretation are evident as you go through this Bible verse by verse. There was no question which side of the fence the publisher was on. In this Bible's introduction, the Catholic version is said to have been made "by the Papists of the traiterous Seminary at Rheims, pretending to discover the corruptions of diverse translations and clear the controversy of these days." The Protestant version was described as the "noble translation ... used in the Church of England." Click on the picture to the right for a close-up look. This Bible also included what was called a "Confutation" (See It) of the Catholic version by the Protestant theologian William Fulke. Interestingly, if the purpose of this publication was to destroy the Catholic version, it did not succeed. You see, this Bible -- sometime's called "Faulke's Bible," gave publicity to the Rheims translation that it would not have otherwise obtained. This page is a reminder of the unrelenting religious hatred between Catholics and Protestants at that time. Be glad you didn't live in England back then.